God needed another little angel. It’s all part of God’s plan. We say so many things when we don’t know what to say. We say things we’ve heard other people say, things that have been said to us, even if they weren’t all that helpful. We say things because it seems better than saying nothing, even if there’s really nothing to say, because we want to do something, even when it seems there’s very little we can do. There’s a lot of counter-cultural wisdom packed into those few verses, and I think they go a long way toward helping us understand the revolutionary claims being made by the Beatitudes, by this recitation of blessings for those the world mostly considers anything but blessed, but the two most important words in my opinion are “God chose.” God chose what is foolish. 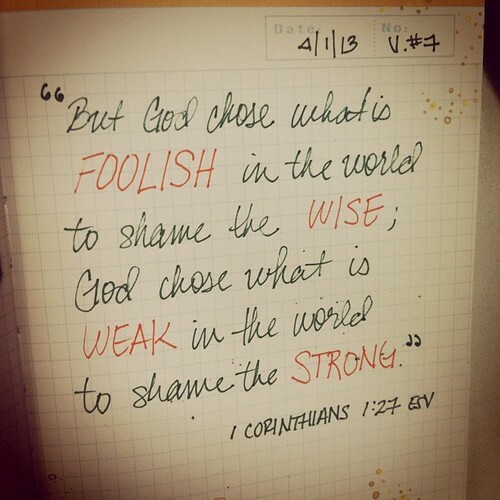 God chose what is weak. God chose what is low. There is an unfortunate way of reading the Beatitudes that too often reduces them to something we might choose. “Blessed are those who hunger and thirst for righteousness” becomes to those who hear it a call to feed the hungry. Don’t get me wrong, we are called to feed the hungry and it is a call that our congregation takes particularly seriously, but the Beatitudes are not simply planks on God’s platform of social justice that we might choose to take up. The Beatitudes are God’s declaration in Christ Jesus that God chooses, and that with God’s election comes a new kingdom, heaven for the forlorn places of this earth, a commonwealth of peace with justice, a beloved community. Similarly, there is a way of reading the Beatitudes that suggests that there is a hidden virtue to being each of these things: that if we make ourselves poor, we will be closer to God; if we make ourselves pure in heart, we will see God; if we make ourselves peacemakers, we will gain access into God’s family. Again, it’s not that there isn’t value to be gained from a life of intentional simplicity, or mercy, or purity; but to read the Beatitudes in this way turns into a program what God chooses, what Jesus declares as a present reality. The Beatitudes are not a list of rewards intended to motivate us toward a new set of resolutions for ourselves. They are a declaration of independence from the values of this world that prize power over people. Last week’s gospel reading ended with Jesus calling the disciples away from their nets. This week’s gospel reading begins a series of readings that we’ll hear over the next few weeks from Jesus’ Sermon on the Mount. Moving from last week to this week, we might imagine that Jesus began his earthly ministry by offering these words of comfort to the wretched of the earth, that the Beatitudes were like so many other platitudes offered to hurting people that offer the promises that things will get better without explaining how that might ever take place. But that is not how it happened. Far from being a set of weak words offered to soothe hopeless people and hurting bodies, the Beatitudes come as a summary of what God in Christ Jesus has already done. His ministry begins with a great gathering of all the people who’d been left out of the social contract made between the empire and its citizens, the people who’d gained nothing from Rome’s never-ending wars with its neighbors. Jesus’ work is like a beacon, a light to the nations, that calls into one assembly those who were weak in their bodies, weak in their minds, weak in their spirits; that calls into one community those from the small towns of Galilee, like Capernaum where Jesus had made his home, to those from Jerusalem, the seat of local power, to those from beyond the River Jordan, who’d crossed a great river, un Rio Grande, to join this new nation, this kingdom of heaven. 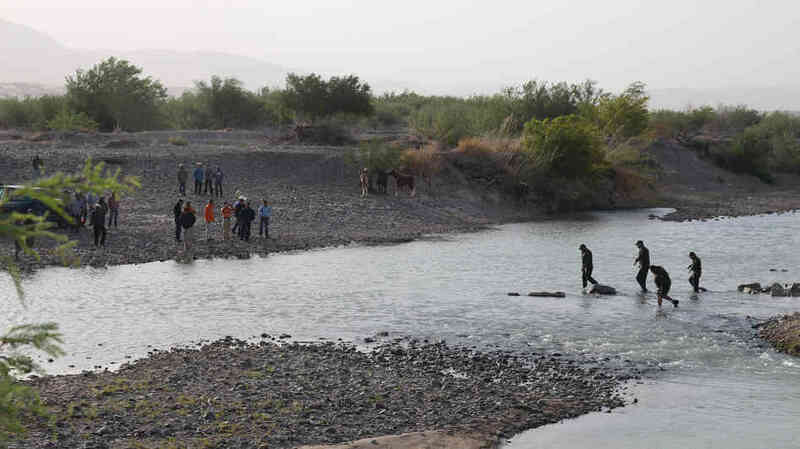 Border crossing at the Rio Grande. What I am saying, sisters and brothers, is that the Beatitudes are not just words of comfort offered to hurting people, not just things to say when you don’t know what else to say. The Beatitudes are a statement of faith that God chooses what the world does not choose, that God chooses you! Paul writes, “consider your own call, brothers and sisters: not many of you were wise by human standards, not many were powerful, not many were of noble birth” (1 Cor. 1:26). He may have been writing to the church in Corinth, but the words became scripture and have been shared with the church for the last two thousand years because they have remained true. Consider your own call, brothers and sisters: not many of you feel chosen by the world. You are elderly, and feel passed over or forgotten by not only friends, but family. You are young, and struggle to find a place to offer your gifts. You are poor, and do not always know how you will make it to the first of the month. You are foreigners, and you do not speak the language. You are gay or lesbian or bisexual or transgender or queer, and you have to convince yourself each morning when you wake up that it is alright to be yourself, to occupy your own skin. You are activists in a world that values conformity. You are recovering from surgeries, you are recovering from addictions, you are recovering from violence, you are recovering from your past, you are recovering from your life. Not many of you are wise by human standards, not many are powerful, not many are of noble birth. But God chose you. Blessed are you. Not because of how special you are, or what you may someday do. Because of who God is, here and now, at this very instant, calling to you, “follow me.” The kingdom of heaven, which belongs to the poor, which belongs to the persecuted, is not waiting for us at the end of this life. It has come near. It has arrived. It is already breaking in, interrupting, uprising. It is now. Blessed are you right now. Where is the meaning in the pits, in the suffering? It is a question worth asking, but it is not answered only with words. 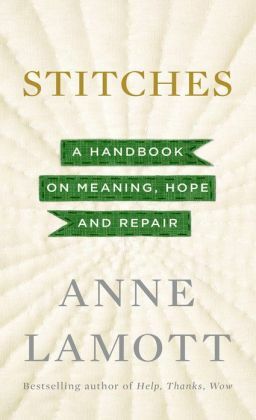 Anne Lamott suggests that whatever meaning is going to be found will be found together, as we stitch ourselves to one another so as not to lose ourselves to the horrors of the world. Jesus launches his ministry by calling together all those whose experience left them feeling lonely and isolated, by touching them, healing them. In response, they followed, they gathered at the mountain to hear what he might say or do next. They went from belonging in no kingdom to belonging to the kingdom of heaven, from being lost to being blessed, just like you.